The collected works of Russian author Leo Tolstoy, including novels, stories and large quantities of letters and diaries and notebooks penned by the writer, are now available to all free of charge on the internet as part of the "All Tolstoy in One Click" project. In the course of the last year and a half, volunteers of the project have transferred 90 volumes of the works of Tolstoy into digital format. Now the tolstoy.ru website is offering free downloads of the author’s works, both as these volumes and as separate works - a total of 761 e-books. "This project is a way to approach today's youth, which reads everything on the screen," said Fekla Tolstaya, one of the author’s descendents, at a press conference. Tolstaya is serving as director and mentor of the project, whose organizers are the L.N.Tolstoy State Museum, the Yasnaya Polyana Museum-Estate and the Russian software developer ABBYY. The most significant part of these digital collected works, according to Tolstaya, is Tolstoy's diaries, notebooks and letters, which earlier were available only as part of the 90-volume series and not published anywhere else. For now, however, the texts are available only in Russian. Perhaps in the future the texts will be translated into English. Tolstoy's dream has virtually come true: All of his texts are now available to everyone. The author declined his copyright: The collected works even open with the sentence "Reproduction is permitted free of charge." It is still not clear whether the project will be realized in other languages as well. Even though Tolstoy himself declined copyright, he made no mention of copyright for translation of the works. But according to Fekla Tolstaya, the organizers are willing to negotiate with translators and republish the collection at least in English. Tolstoy's works have still not been translated in their entirety in one single language. The publication of the original 90-volume collection was initially timed to coincide with the 100th anniversary of the author's birthday, with the volumes published gradually over the course of 30 years (1928-1958). Many people subscribed to receive the books, unsure whether they would live to see the publication of the last volume. Now it is practically impossible to buy the printed collection in its entirety and even in libraries you are only likely to find part of it. ABBYY prepared the digital version of the pages, putting the scanned material through an optical character recognition program. Afterwards it was placed on the internet on the readingtolstoy.ru site, with an invitation to users to read the Tolstoy volumes and simultaneously correct the imperfections of the automated recognition software. People of various ages and professions accepted the challenge: from managers to housewives, from 259 Russian cities and 49 countries. The first phase of reading took only two weeks: In this period more than 1,000 volunteers read 46,820 pages of text. It was calculated that the volunteers’ overall reading speed was 8.5 volumes or 3,344 pages a day. The text was read several times. For the second reading the volunteers were selected, as well as for the third, which involved professional editors. A total of 3,249 people participated in the project. Some of them purposefully aimed at setting a record: For example, one Alexander Aksyonov read 6,081 pages. "Many volunteers just wanted to be the first to read the diaries and letters that had been inaccessible earlier," says Yury Koryukin, CEO of ABBYY Russia. The readingtolstoy.ru site now offers those who have registered the option of using an interactive map to see who is reading Tolstoy all over the world. You can also add a favorite quote to the collection or find another one using special tags and share it on social networks. 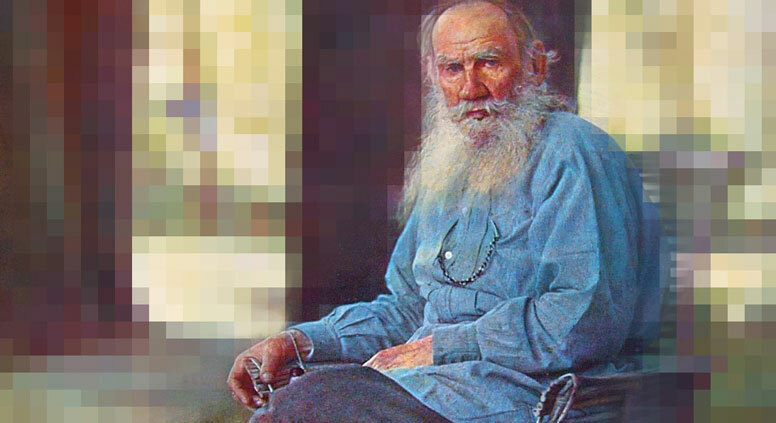 While preparing the text for the internet, specialists from the Higher School of Economics in Moscow noticed that it is now possible to study the linguistic composition of Tolstoy's works with the use of a search engine. For example, it was discovered that the longest sentence from War and Peace contains 229 words and is located in the novel's third volume in the third part. Using the same method, the wardrobes of the protagonists can be analyzed: For example, the author mentions 120 different dresses in the course of the novel. You can see that in the second "peace" volume there were no overcoats or boots, which were abundant in the "military" fourth volume. It also turned out that, as was expected, Pierre Bezukhov eats more than anyone else, and that, unexpectedly, Natasha Rostova is the one who speaks the most, while fatty Pierre is one of the biggest listeners. These are not serious studies; this is all for fun. But the toolkit that will be used in the future is clear. "Before no one dared to approach such a voluminous work - the creation of a Tolstoy dictionary - but now it will be possible," says Culture Advisor to the Russian President Vladimir Tolstoy, another one of the author’s descendants. "We are still unaware of the depth of everything that has been done and is being done."